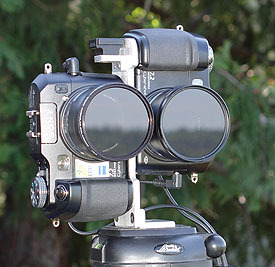 The art and science of twin camera digital stereo photography. This site features digital stereo photographic pairs, along with practical details for creating your own digital stereo photographs: techniques, cameras, controllers, flash, sync monitors, and mounts. Advanced shutter and flash controller for twin SLR cameras. Advanced camera and flash controller for twin Sony cameras. Advanced controller for twin Sony digital still cameras and for twin Sony and Canon video cameras. Custom, for twin Sony DSC-V3 cameras. Advanced twin camera flash controller. The stereo pair is the essence of stereo photography. At the above right is a pair of Sony DSC-V3 digital cameras mounted to take parallel stereo photographs, controlled with a LANC Shepherd wired remote, described in detail in the pages here. To view a stereo pair and enjoy the additional dimension takes extra effort. One can use a viewing device or try your hand at free viewing. Leda, heroine of Greek mythology, gave birth to the Gemini twins Castor and Pollux. However, Castor was son of King Tyndareus of Sparta, while Pollux was son of the god Zeus. In the constellation of Gemini, the stars Castor and Pollux dominate, and Castor is an astounding multiple star consisting of six separate components, while Pollux is an orange giant, the brightest star in the constellation.